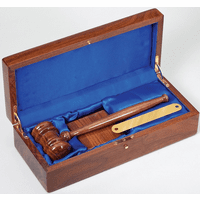 FEATURES/SPECS This personalized gavel and stand is a great way to recognize a special achievement from a lawyer, judge or other legal professional. 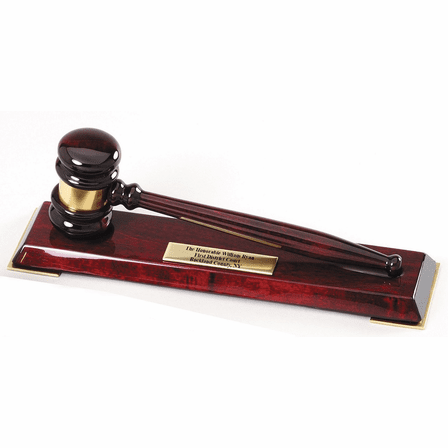 Both the gavel and the stand are made of solid wood with a lacquer coated rosewood finish. 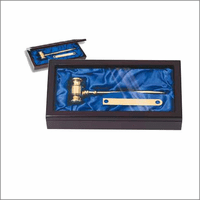 The gavel has a gold band wrapped around the head of it. The base comes with metal feet at each corner. 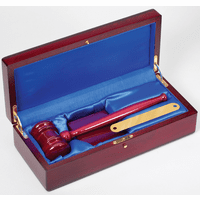 A laser engraved personalization plaque can be attached to the base free of charge. Add text or a logo by checking the boxes above. For logo orders, we'll email you a proof before finalizing the customization. 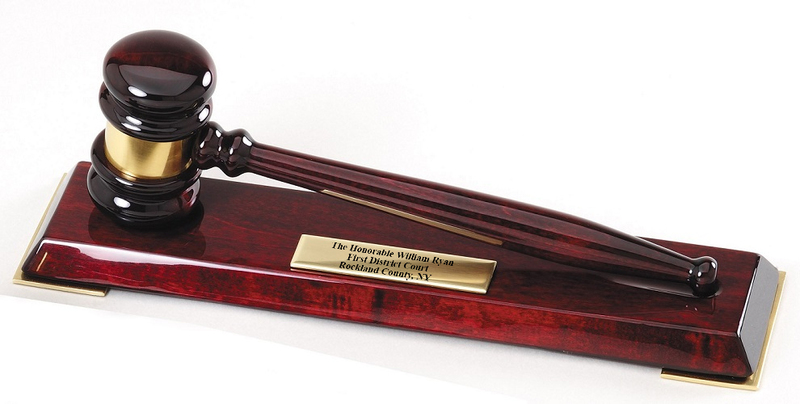 Just a few days before Christmas, my sweetheart mentioned that he wanted a gavel with his name and his court engraved. I thought, "Now he tells me?" and I was sure I wouldn't be able to get it by Christmas, or if I did, that it would be done incorrectly. That was not the case. The item arrived promptly, and it was perfectly engraved. It appeared just as advertised. 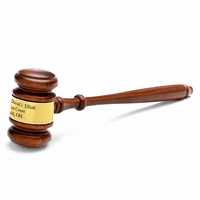 It was a beautiful piece of wood as well, and polished to perfection. I am impressed. What a beautiful memento! The engraving came out just the way I wanted it and the packaging it came in is wonderful as well! Highly recommend! Thank you for a flawless gift. I was thoroughly pleased and the recipient was as well. Everything was great from the time I placed my order. Staff was friendly and helpful. I received my order in a timely fashion, and it looked better than expected. I would highly recommend this company to friends and family. I will be using them again for all future gifts. Thanks Executive Gift Shop! !